Hi it's Suzanne! 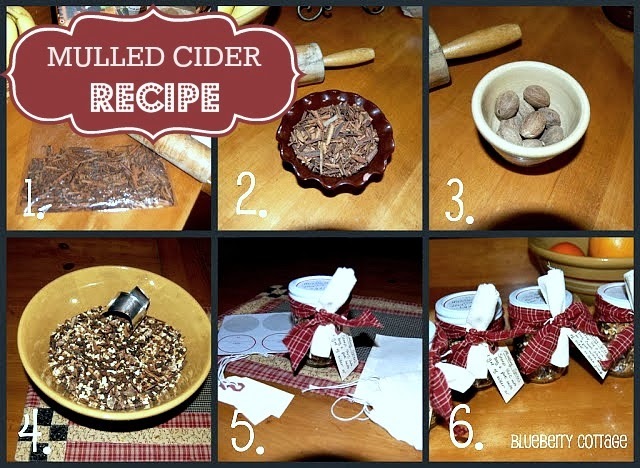 Today I'm sharing how I make mulled cider. This is a favorite gift to give and kids love helping make this because there is alot of banging and crushing and a whole lot of noise in general goes along with putting this together. Sorry for the substandard picture quality , but I had kids running with heavy rolling pins, spice dust threatening to get on my camera lens and two nasty corgis fighting at my feet. Corgis are a bit high strung and the banging of the cinnamon and nutmeg was inciting a riot amongst the corgyn. They're all better now, but I was tempted to slip them a little something to calm them down! 1. Put a bunch of whole cinnamon stix in a bag and bang until broken. Put into bowl. 3. Do the same thing to the whole nutmeg as you did to the stix. Put in the bowl. 4. Put the rest of your spices in the bowl and let the kids sift through it all, mixing it all up good---they love this part too. Scoop mix into jars. Mulling Spices- Put 1/4 cup of mix into muslin bag and cinch closed. Toss into a pot or crockpot with 1 gallon of apple cider or cranberry juice and heat on med-high for the stove top or for 45 minutes in crockpot- then turn to low until you get it just to where it is a bit hot but not enough to burn-know what I mean? Turn to keep warm on your crock or low for stovetop for the duration of your party. Take out spice bag and discard spices, rinse bag and save for next batch or toss- Enjoy! 6. Roll the muslin bag up and tie the label onto it. Now wrap a piece of homespun fabric strip around your jar and tie once to secure, then tie the strip again with the muslin and directions into it. *I buy all the ingredients for this either from Mountain Rose Herbs , our natural food store or I order it through our Farmer's Co-op. Wherever I can get the best price! The labels for the top were from a Martha Stewart cookie project. Michael's Craft store has all these labels in the sticker/scrapbooking section. Avery has FREE label downloads-so try that! Plus there is skads of online label designs for free if you do an internet search. ***Feel free to adjust this gift to however it works for you! Blueberry Cottage warmly invites you to join our Facebook community, receive our Twitter updates, be inspired on Pinterest, or subscribe to the blog via Bloglovin'. Thanks so much Suzanne! I love any recipe I can include the littles in. Be sure to check out Suzanne on her blog!